Trying to Conceive? 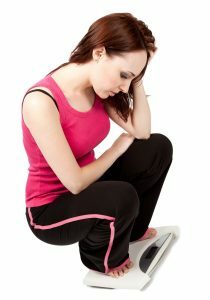 Learning how your weight affects fertility is critical! A woman’s body is very protective of the unborn. That’s why conceiving is more difficult if you are underweight or overweight. 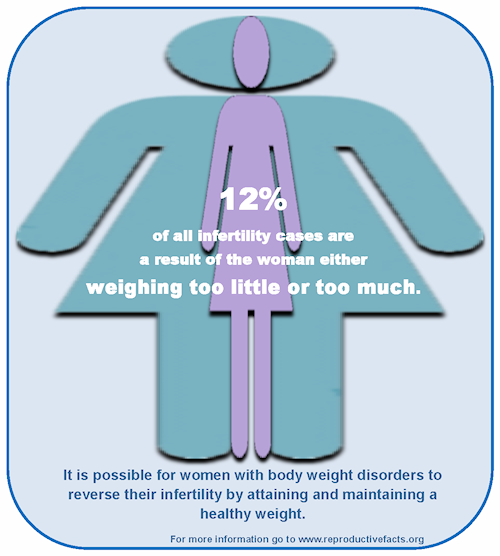 In fact, 12% of infertility is thought to be due to weight issues. Weight also affects a man’s fertility. Body fat seems to be the synchronizing factor (or the conductor) for the harmonious hormonal symphony that must take place in order for pregnancy to occur. Because fat cells make estrogen, having too many or too few fat cells affects the amount of estrogen in the body. And that affects fertility. A certain amount of body fat is needed for regular menstrual cycles and ovulation. In fact, body weight changes of just 10-15% below normal can disrupt menstrual cycles. If you’re seeking help for infertility, please make sure you’re not underweight. Research shows that being underweight increases your chances of having a low birthweight infant or a baby that is born preterm. Some fertility treatments greatly increase your chances for having twins or more, and this further increases the odds for having low birthweight infants. Being underweight can affect your fertility. A body weight closer to your ideal weight is best for conceiving and for carrying a healthy baby to a healthy weight at term. For women, excess body fat can affect the amount and types of circulating hormones, which influence fertility. It’s estimated that 25% of ovulatory infertility can be attributed to being overweight. Overweight is linked to Polycystic Ovary Syndrome (PCOS), a cause of infertility. Insulin resistance, which can result from having PCOS or being overweight, is also related to infertility. Both PCOS and insulin resistance are discussed in my post here. But there’s good news: studies show that overweight women have great success in conceiving once they are closer to their ideal body weight. In fact, just losing 5-10% of total body weight can dramatically improve ovulation and pregnancy rates. In one small study, just losing 14 pounds (6 kg) drastically improved ovulation and pregnancy rates. An expanding waistline can affect a guy’s fertility too. In fact, it’s double trouble if both partners are overweight; it increases the likelihood that it will take more than a year to get pregnant. Overweight men tend to have lower testosterone and increased estrogen levels and decreased ejaculate volume. Men with a BMI > 35 are more likely to have a lower sperm count and higher numbers of sperm with DNA damage, compared to normal weight men. Sleep apnea, which is more common in obese men, can also cause a decrease in testosterone levels. Excess fat in the inner thighs and pubic region may also cause warmer temperatures in the pubic area, which is enough to change sperm production. Make a goal to lose or gain weight. Keep a food diary. Figure out what you need to change. Be more active. You don’t have to join a gym or get a personal trainer. Just start walking, even if it’s in place in front of the TV! Need help? Consult a registered dietitian. Find one here.